Starting to incorporate visual storytelling as a collaboration or facilitation tool can be a daunting thought. What if I start drawing on a whiteboard in front of a room full of people and it looks terrible? 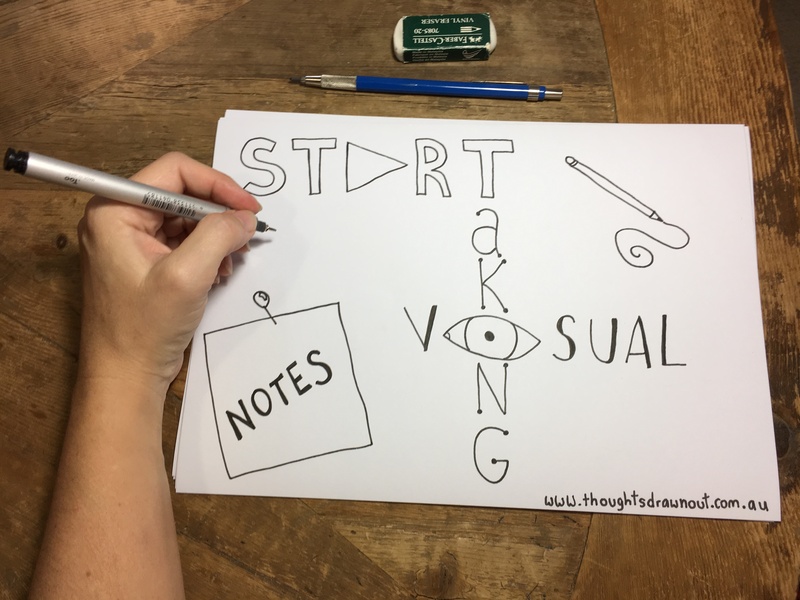 Chances are it won’t, but if the fear is too much, a great place to start is taking visual notes in your notebook – called sketchnotes. Sketchnoting will give you a safe place to practice and you never have to share them with anyone if you don’t want to. 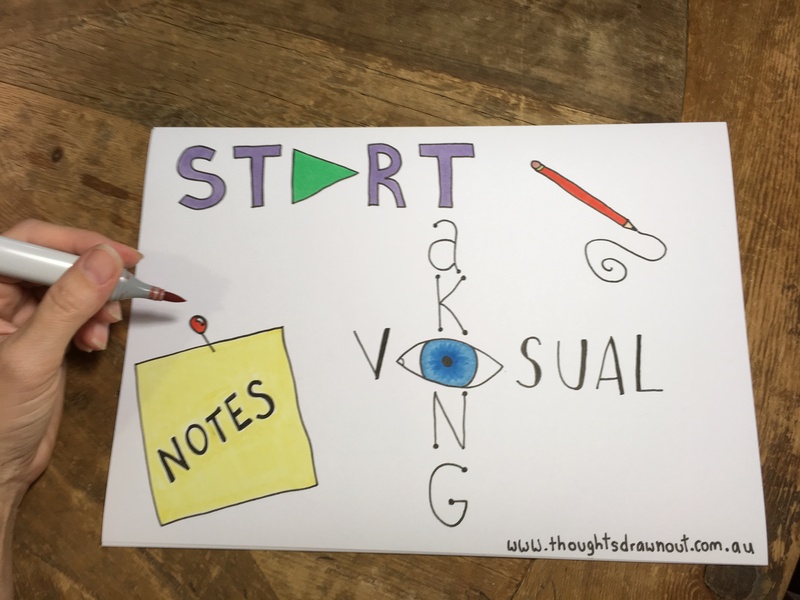 You can use visual notes for your everyday note taking in meetings or if you are listening to a presentation or a lecture, even when you are brainstorming ideas in your notebook. There are great personal benefits to the practice too. When I take visual notes I find I listen better when I know I am trying to visually capture content. I apply an extra level of sense making over the content I hear or see because I am trying to make connections and find themes. And I have better recall of the content down the track when I refer back. Not to mention all that drawing practice! 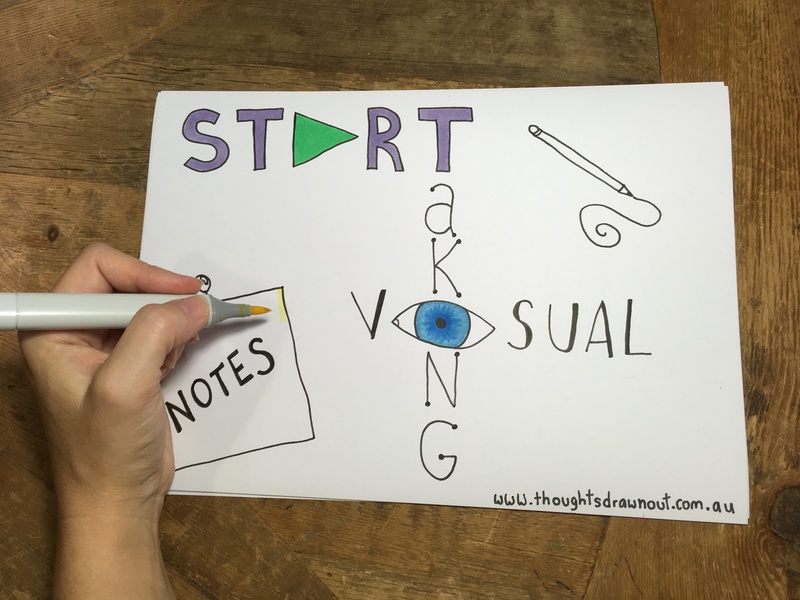 The first rule of starting to take visual notes… is to start taking visual notes. I promise it won’t be as painful as fight club. You just have to be brave and jump in. Those lines are caging you in and keeping you thinking in linear dot points. If you switch to a notebook filled with expanses of clean, white possibility you are more likely to inspire your brain to fill the space differently. Force yourself to take your first note somewhere other than the top left. Think about the kind of content you will be capturing and let the content dictate the shape and layout of the page. If you’re not sure, start in the centre. Your page will look great if you find a pattern and repeat it. A simple pattern to start with is to form little story clusters. Summarise a chunk of content into a sentence or short paragraph and then add a simple icon that captures the core of the message. Then repeat these all over the page until you have captured everything. Once you do a bullet point, your next note will inevitable become another bullet point directly under the first one and then your whole page is doomed. Don’t draw the dot and think about how you might form your text other than just lines that span the full width of the page. Direct quotes, anecdotes and stories will help you remember more than just capturing the punch lines or key points. The quotes and stories add the human-ness and memorable moments. A random bunch of captured ideas scattered across the page is good, a way of understanding where they connect is better. Think about how you sign post your page or guide your eyes in a particular order. This might sound counter-intuitive when you are trying to quickly capture a lot of content but there isn’t much point if you can’t read it later! I focus on each letter as I write, forming it carefully and giving it enough breathing space on the page. If you do this your lettering will look neat regardless of your font style. You can play around with different fonts later – start by mastering one. 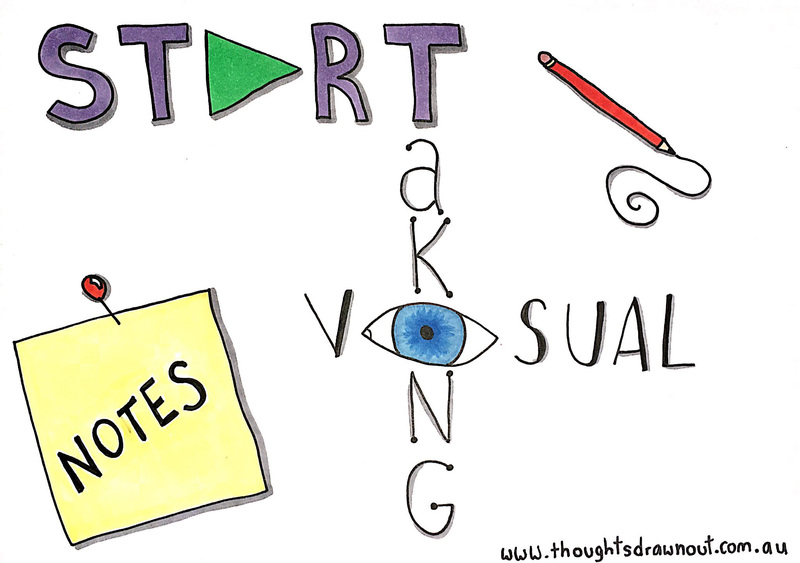 Once you start taking visual notes you give yourself a benchmark. Every time you take new notes you can evaluate what you like, what you think you might repeat, what you would do differently next time. You can stretch yourself a little each time. Most importantly, have fun! 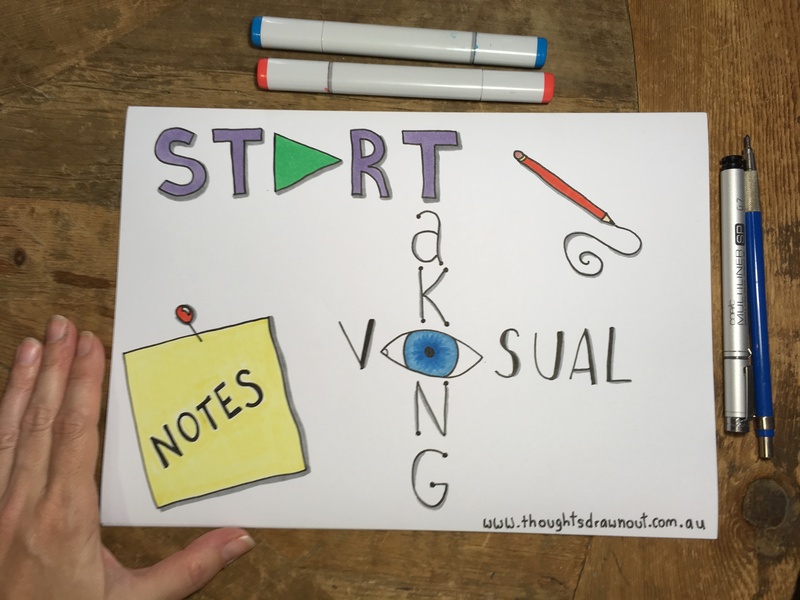 If I’ve inspired you to try taking visual notes I’d love to hear from you! Drop me a line and send me a pic of what you’ve done. Want to receive my posts directly into your inbox each week? Then hit the subscribe button!